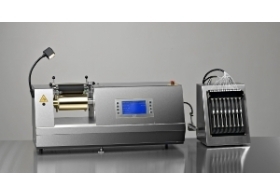 This instrument uses tack measurement as a function of emulsification. The optional torque sensor can provide additional information about the change in rheology of the ink as function of emulsification. The system is not designed to measure absolute tack and therefore bears no resemblance to the TackOscope, except for the lay-out and precision of the tack sensors. The concept of the HydrOscope enables the user to build a comprehensive database based upon the known performance of ink-fount combinations and as such offers the ability to detect and predict combinations which can cause ink/water related problems during printing. Determination of the "water window"